Spain's Crisis Pushes Educated Into 'Economic Exile' Debt, austerity and joblessness have prompted more people to leave the country in search of work. In the first six months of 2012, emigration from Spain is up more than 44 percent from the same period last year. The Spanish government denies it, but the "brain drain" has become something of a flood. 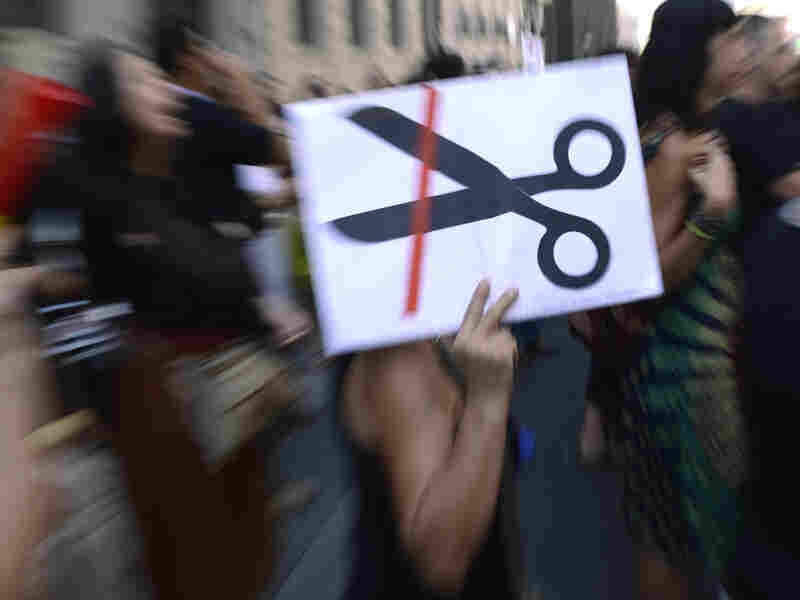 Government employees demonstrate against the Spanish government's austerity measures in Madrid, on Friday. The economic situation has forced some Spaniards to leave the country for work. In Spain, the growing crisis — debt, austerity and joblessness — has prompted more people to vote with their feet. In the first six months of 2012, emigration from Spain is up more than 44 percent from the same period last year. The Spanish government denies it, but the "brain drain" has become something of a flood with more and more educated, skilled Spaniards moving abroad. Neurobiologist Elisa Cuevas Garcia from Madrid sips an iced espresso on a hot afternoon at an outdoor cafe in Berlin. She works researching a gene that one day might help treat central nervous system disorders, including spina bifida. The Spanish government subsidized her training, but she left Spain a few years ago for a research post in Berlin where she's finishing up her Ph.D. The 27-year-old says nearly every one of her friends in the sciences has left for work abroad. "We are all away — New York, Chicago, Glasgow, Edinburgh, Germany," she says. "But just one friend ... is still working on a lab in Spain, and I'm really worried about him." More than 53 percent of those under 25 years of age in Spain are jobless, and overall a quarter of Spaniards are unemployed. That's the highest jobless level since Spain began keeping records. Cuevas Garcia says when the economic crisis began, she thought maybe it'll be good to be away for a little while, let things improve, and then come back home with new work experience. But now, she says, returning home is simply not an option. Spain's education minister, Jose Ignacio Wert, denies there's a brain drain. He notes that his government's emigration data show little information about education levels and other key details. Besides, he says, it's a global economy — people move around. But Cuevas Garcia says the minister is dangerously misguided: Spain's talented young people are not just leaving as part of a globalized workforce. The crisis is forcing them away in droves, and she worries the damage will be long-term. "It's a brain drain, and they keep denying it. ... It's reality. Let's say tomorrow you wake up, everything back to normal, crisis over — the damage already done is going to be really difficult to make up for," she says. "This makes me feel sad and frustrated because I know it's not a matter of time any more, it's a matter of generations. And you don't know how many." Top European destinations for departing Spaniards are the UK, France and Germany. Language programs in both Spain and Germany report a steep rise in the number of Spaniards taking German classes. Government statistics show Germany's population this year increased for the first time in a decade, largely because of increased immigration. There are language and culture challenges, but Cuevas Garcia says it's been worth it. Going back home to Spain for holidays, she sits next to cousins who are waiting for jobs that never come and gets approving nods from older relatives who understand she did what she had to. "I'm not just paid for my job, I'm doing what I studied for," she says. "It's a privilege taking in account the current situation. So you really have this look from the elders saying, 'Wow, good for you.'" She's doing a lot better than many young Spaniards, but she's still angry. She went to an anti-austerity demonstration recently at the Spanish Embassy in Berlin. Spanish banks and home owners are in deep trouble, in large part because of a real estate bubble that burst. Cuevas Garcia says she's angry at her government for inaction during boom times, at banks for unbridled greed, and at fellow citizens who were apathetic as long as the housing prices kept going up. "I remember hearing that my whole life: 'Just get some job, and just get into a mortgage, and if you don't want to live there anymore, you just sell it. It will always go up,' " she says. "And suddenly it didn't. It was like the base of all our beliefs, and suddenly that was not true anymore." When she finishes her doctorate, she says she and her boyfriend — also a Spanish scientist living in Germany — are hoping to move to the U.S. Cuevas Garcia is resigned to what you might call "economic exile" — a long, long period away from home. "I don't know if this second time I will start really noticing that I don't know where I belong anymore and that you really feel you are away," she says. "If I ever have kids, I don't know if they'll ever be able to go back to Spain the way I knew it. It will be very, very different."